My individual project came to me when my boyfriend asked if I wanted to see the ‘Grudge’ which is my most nightmare movie to ever watch. However I did not know that there was a Japanese version. The Japanese version back in 2002 was known as Ju-On and is actually the first and the American is classified as the remake. I found that depending on the order I would view the films as the American version has three sequels as well as the Japanese yet completely different stories which I may later follow through. So I wanted to take on the two different views to compare the differences between them just by my experience of viewing them and then going further into researching key aspects to understand the film more. Like how we experienced within our first weeks of the semester with watching Godzilla, Akira and the documentary State of Play. I will be using Autoethnography to understand the side of horror in movies from the Asian area. By using Ellis reading to understand further an in-depth approach of Autoethngraphy requires one to first analyse the reading/source then go further to analyse its background/knowledge to better understand it.This is by using personal experience then comparing it to that of cultural. First part of my assignment I watched the Grudge, the American version. 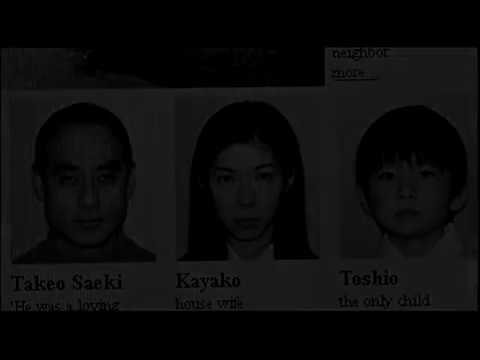 I decided for this blog post I would not go in depth with specific information from the movie which is actors, dates, etc till after my second post that analyses Ju-On. I will not include the video footage I used during the process as I want to use it for my final project. Key Quote: When someone dies in the grip of a powerful rage. A curse is born. Rewind: The movie then centres on another American couple (Jennifer and Matthew) that is buying the house with their mother (above) and their sister. The elderly woman(Emma shown above) is present just before with the young American woman (Karen) before the grudge appears. Rabbits Feet/technology when present with a ghost around to look further into which also can be found when the detective finds the tap tampered with by the grudge. I believe for more suspense plus more death when all detectives die as they try to burn the house down but failed. The young American couple go in the house and the man becomes frightened by the grudge and paralysed. The woman tries to do the same as the detectives but fails as well and sees the grudge at the end haunting her. It is found out that the original couple that lived in the house that created the grudge was a mother, father and son plus cat that all died from the father due to a jealous view of his wife and an American man that died at the beginning. Above shown. =Images used are not my own but found from the IMBD website. Here. I think what you are looking into will be interesting. A comparative autoethnographic view of The Grudge and Ju-On will be interesting, as there are sure to be many cultural differences between the two. A difference you could look at might be Japanese and American film conventions. In your quest to understand Asian horror, I am glad you watched the American version first, as it will give you a frame of reference for your viewing of the Japanese Ju-On. Another area you might consider looking into is the difference in symbolic meaning. Take the black cat for example, In the majority of the western world, the black cat was seen as an evil omen and familiar to a witch. However, in Japan, black cats are actually seen as symbols of good luck. Your final projects sounds very interesting! I think watching the remakes of those horror movies will give you different perspectives and see how much they are similar to one another. I always find that the Asian version of horror films are much more scary and memorable. The American version usually just makes me jump but I don’t really find it too scary.